Our John Michael Exquisite Weddings and Catering team just had our collective minds blown. Some moments in your life are just beyond words, and this is one of them. We adore the Perfect Wedding Guide. Their local Orlando Perfect Wedding Guide team hosts amazing wedding shows, creates an excellent wedding magazine that is available to recently engaged couples across the region and hosts some incredible events for local wedding vendors too. 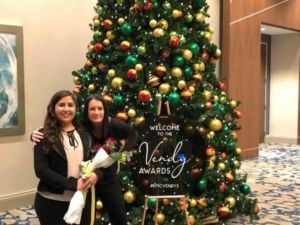 This week they hosted the 2018 PWG Vendy (Vendor’s Choice) Awards. These awards recognize central Florida wedding vendors for outstanding service and they are nominated by and voted on by their peers; other central Florida wedding pros. This section of the voting process is where vendors could write in and nominate the company they believed best fit the above description. Our John Michael Exquisite Weddings and Catering team is BEYOND THRILLED to announce that our peers awarded us the Milestone Award for companies who have been in business over 20 years. 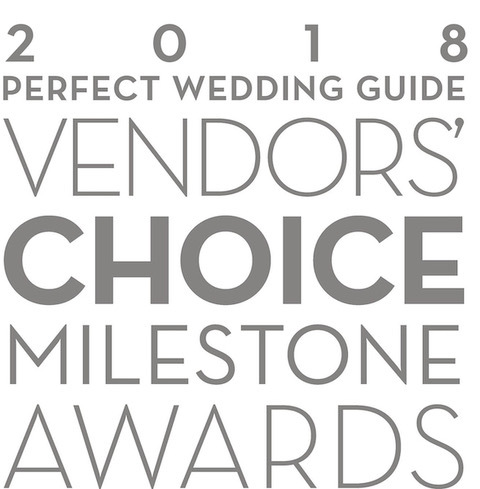 According to our Orlando Perfect Wedding Guide colleagues, we received multiple nominations (all anonymous), and they were kind enough to share one with us. We are thrilled, honored and humbled by this award. Thank you to Perfect Wedding Guide, the awesome wedding professionals in the greater Orlando area who nominated us and who we have the pleasure of working with all year long. Thank you to our Sales Coordinator Giselle and Chef / Kitchen Manager Tanya for accepting this amazing award. 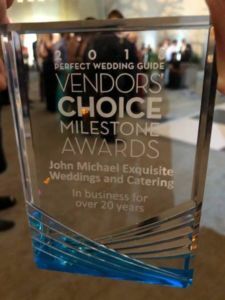 Last but not least, John Michael Exquisite Weddings and Catering’s entire team; We could not have done this without each and every one of you.